Home » The Blog » Health Matters » Exercise » Exercise? Track and Field at 77! Exercise? Track and Field at 77! Exercise? Starting Track and Field at 77! Olga Kotelko, who is now 95 competes in high jump, hammer throwing and the 200 meter run. She holds 26 world records. How old are you and I right now? What is our attitude to exercise? 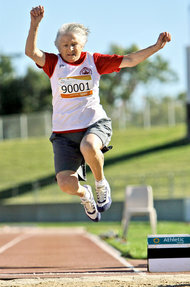 Well Olga just started into track and field at the age of 77. Maybe there is hope for us to get into the “Keep Moving” culture and reap the benefits for quality of life. Journalist, 47 year old Bruce Grierson became intrigued by Olga and her physical accomplishments and of course her age. He saw a huge contrast between Olga’s and his own physical state. “Whatever was happening with her,” he writes in the prologue of his latest book,“was the opposite of what was happening to me.” If he could identify the reasons she was aging so well, perhaps he could reset his own course. Among the potential anti-aging elixirs Mr. Grierson explores, exercise appears most potent. This old standby doesn’t just keep hearts pumping and muscles strong; studies suggest it may protect the mind, too, by promoting the formation of neurons in the hippocampus — a part of the brain associated with memory. “For building cognition, Sudoku is a shovel, and exercise is a bulldozer,” Mr. Grierson writes. This is an update on this amazing lady who started into track and field at the age of 77. You will love her sweet personality and sense of humor. Olga died in June 2014 at the age of 95 from a cranial hemorrhage. She had been competing just the week before. Source The Globe and Mail (Canada). Evidence is all around us that a few changes in lifestyle can have an enormous influence on our quality of life. Perhaps this is just what we need to get us all off the couch and to seriously get out and exercise and enjoy ourselves. In the process wouldn’t it be good to make our brain healthier and increase our quality of life. Let us know ways that you find to exercise and to keep moving. You may also enjoy the post Keep moving to regenerate the brain.